The City of Vancouver has a desire to redevelop the Cambie Corridor and launched the three-phase planning program in 2009 with the purpose of guiding long-term, transit-oriented growth. The Cambie Corridor is located in central south Vancouver and encompasses approximately 2,471 acres. This area extends 6km from West 16th Avenue to the Fraser River and is bordered by Oak Street and Ontario Street. 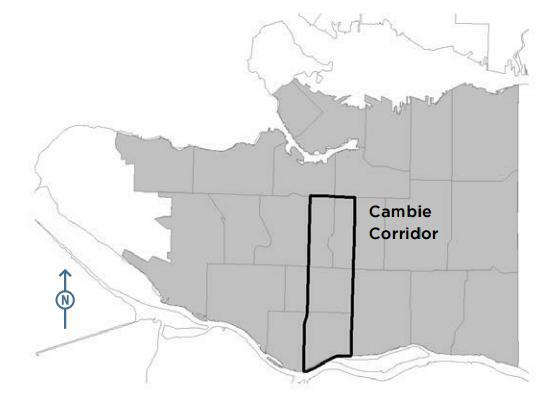 The Cambie Corridor has roughly the same population as the West End, but five times the land area. 4 out of the 9 Canada Line stations are within the Cambie Corridor. Map view can be found below. Currently, Phase 3 is underway by building on the plan, focusing on land use and new housing opportunities while remaining within close proximity to the Canada Line stations. On June 12, 2017, the City announced that there are 11,500 new homes planned for the Cambie Corridor, of which more than 4,000 are intended to be "affordable" homes, including social and rental units that are linked to residents' incomes. According to the City, the new interim 10-year housing targets will create housing that is "based on what people can afford, in new locations, and in housing forms that will meet the needs of our diverse population". These housing targets will be refined throughout the fall and will form part of the final Housing Vancouver Strategy.